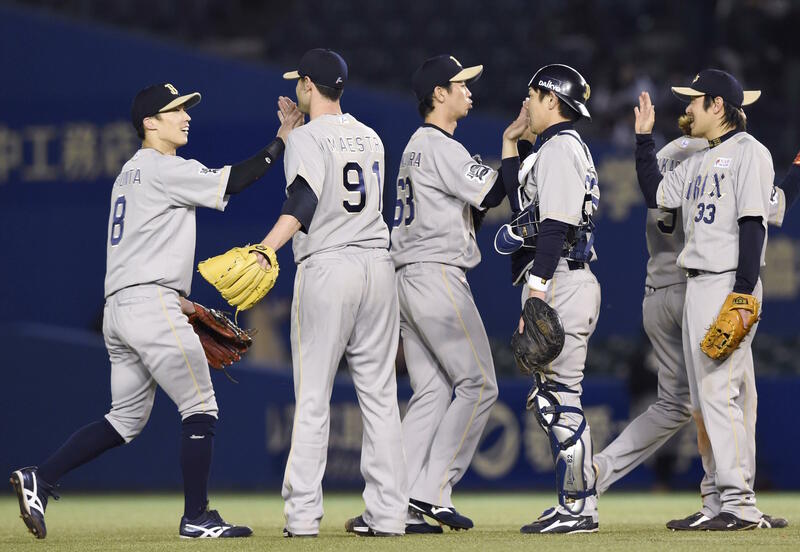 CHIBA - Considered one of the favorites to win the Pacific League, the Orix Buffaloes have been through the wringer this spring. In the months since manager Hiroshi Moriwaki’s men finished within a hair of last year’s PL pennant, Orix was Japan’s most active club in the offseason, but the Buffaloes stumbled out of the gate to start the season. On April 15, Orix was 2-14 with one tie, 9½ games out and in last place with PL batting champ Yoshio Itoi hitting .200. “Neither the offense or the defense was consistent,” head coach Junichi Fukura told Kyodo News on Tuesday at QVC Marine Field just before the team extended their only win streak of the season to four games with a 12-inning victory over the Chiba Lotte Marines. Orix is still without ace Chihiro Kaneko, whose right shoulder was cleaned out in November, and the casualty count has increased since Opening Day. Closer Yoshihisa Hirano, setup man Tatsuya Sato and workhorse middle reliever Motoki Higa are all out. On the offensive side, newly acquired slugger Tony Blanco was deactivated with knee trouble shortly after Opening Day, and speedy utility man Esteban German soon followed. Many of the position players who were healthy did not hit, including free agent signings Eichi Koyano and Hiroyuki Nakajima, and returning slugger Takahiro Okada, who looked resurgent in the spring. When the Buffaloes arrived in Chiba, Okada and batting coach Shinichi Sato had both been relegated to the minors, while Nakajima was out with a bad hamstring — pushing Takuya Hara, a career .230 hitter with no power, into the lineup. On the other hand, Itoi has begun swinging as well as he had last year, and foreigners Francisco Caraballo and reliever Alessandro Maestri have been playing at a high level. The Buffaloes had been not playing as badly as their record suggested, but lost three tight games to open the season. 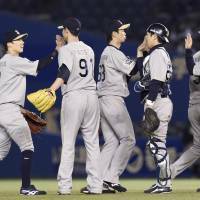 Pitching coach Ikuo Takayama said Kaneko should soon resume throwing, but that the bullpen crisis makes the work of the starters harder. Dickson, who bounced back from a seven-walk nightmare in Sendai on April 10 to throw a complete game victory last Saturday, said he never considered the bullpen culling an issue. “All those guys are up here for a reason,” he said. “Everybody has a bad game, too. My example is Sendai. That was just a bad game for me. All those guys are really good. I trust every one of them to come in behind me. During their current streak, the bullpen has stepped up, allowing two runs over 13⅓ innings, including five scoreless frames in Tuesday’s 5-2 victory.